The Pioneer AppRadio 4 (SPH-DA120) supports Android smartphone connectivity via different connections. Finding the correct cable kits to connect your smartphone to the head unit can be tricky. Pioneer has a few charts and diagrams that can help make the process simpler. Through Android, users can play music from the smartphones, stream Pandora, audio streaming via Bluetooth and above all, use Pioneer AppRadio Mode with the correct cables. Although some of the latest smartphones like the Samsung Galaxy S5 and Google Nexus 5 can be connected to the AppRadio 4, there are a few compatibility issues at the moment. More on this later. 1. What type of connections does my smartphone support? Depending on the type of connection, the cable kit required from Pioneer will differ. 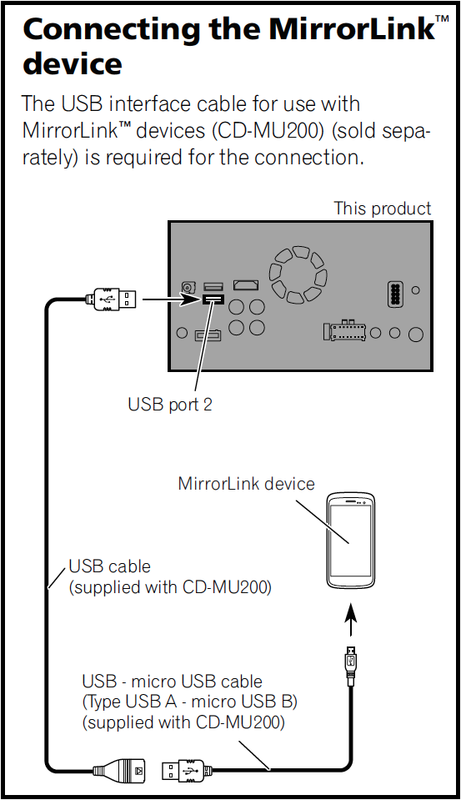 For example, if your device supports MirrorLink, you will need the CD-MU200 kit from Pioneer. 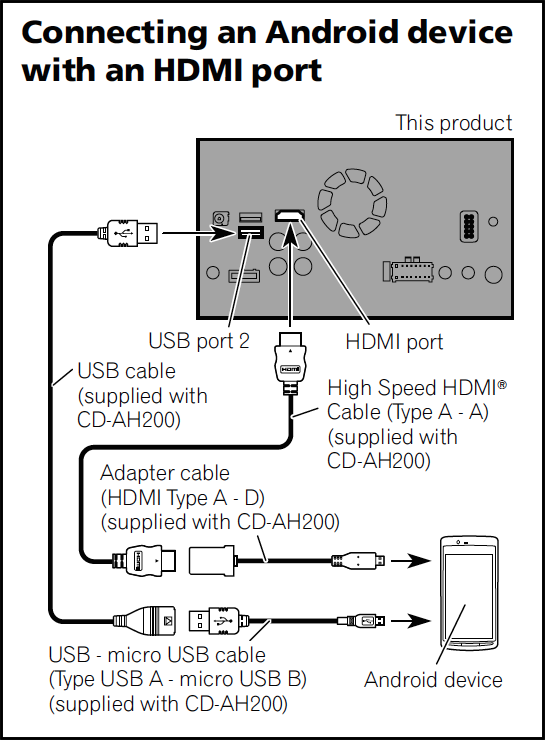 If your device has any type of HDMI port, the CD-AH200 kit will be required. 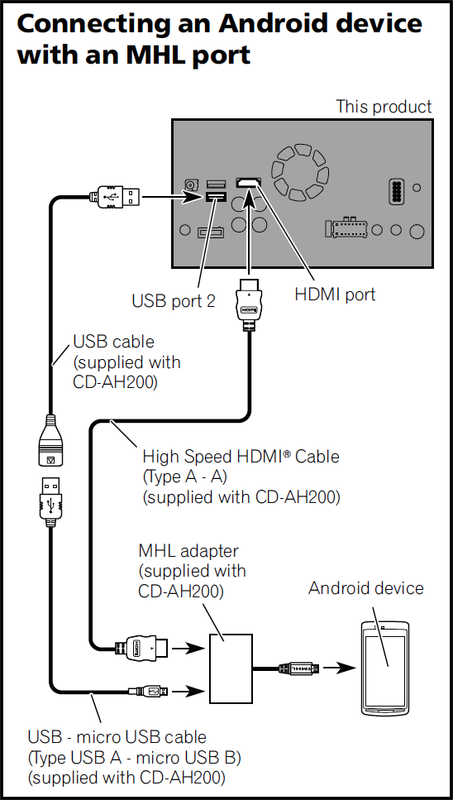 MHL connections will also use the CD-AH200 kit. There are two USB ports on the AppRadio 4. USB 1 is used for Apple CarPlay and firmware updates. USB 2 is reserved exclusively for Android connectivity. Whether using the CD-MU200 or CD-AH200 kit, you have to connect the USB cable to USB 2 on the back of the AppRadio 4. If you use USB 1, the connection won't work. Samsung smartphones require additional adapters to connect to an AppRadio 4. Samsung Galaxy S3 users require the HDMI Smart Adapter (EPL-3FHUBEGSTA) in addition to the Pioneer kit. Galaxy S4 users will need the HDTV Adapter (EPL-FU10BEBSTD). 4. What Android OS version are you using? Find out which Android OS version you are currently running. According to Pioneer's smartphone compatibility chart, Android 4.3 is the latest OS that is supported. This depends on the smartphone too. The full list of supported devices and OS information can be found here (scroll to the bottom of that page). 5. Is your smartphone a Galaxy S5 or Nexus 5? The Samsung Galaxy S5 and Google Nexus 5 are not officially compatible with the AppRadio 4. This doesn't mean they won't work. Some functions have been reported to work with these smartphones. Pandora for example, works without issues over Bluetooth. The required adapters for the Galaxy S5 are not known at the moment. There is no release date available for Google's upcoming mobile OS, Android 5.0 Lollipop or Android L. Whether there will be compatibility issues with the AppRadio 4 remains to be seen. We will know more when the OS becomes available for download. What we do know, is that Android L supports Android Auto. But the Android Auto aftermarket blueprints are not available at the moment. After you wire up the smartphone to the AppRadio 4, you need to pick the correct Smartphone Setup to be able to use your device. In 'Settings' on the AppRadio 4, click on 'Input/Output Settings' and then 'Smartphone Setup.' Here you have to select 'Others' for Device and 'HDMI' for Connection if using an HDMI device, or 'USB' if using a MirrorLink device. Bluetooth: Next pair your device via Bluetooth to the AppRadio 4. This can be done in the Settings menu. Functions available: The AppRadio 4 shows which functions will be available for a particular smartphone setup you have chosen. This is seen on the 'Smartphone Setup' screen in Settings. For example, when using a MirrorLink device the functions available will be MirrorLink, iPod (or Music from your smartphone library) and Pioneer AppRadio Mode. We will continue to monitor Android connectivity for the AppRadio 4 in the coming weeks. Also, Android 5.0 Lollipop information will be updated when the OS becomes available. We will have that news for you too. So stay tuned for the latest and feel free to ask any questions you may have in the comments below. What about Asus Padfone 2? Does someone have experience with connectivity of this phone? Hope its better than AppRadio 3. The most unreliable and dangerous bit of tech I've ever bought. Because the are no buttons to 'feel' when on the move you are forced to constantly take your eyes off the road or concentrate on driving and leave the unit alone. Come on "Really" No Galaxy S5? Does anyone know if the HTC desire 626 is compatible? Anyone know if Android Auto will be available in the future on the Appradio4? Anyone know if Android Auto will ever be available via an update to the Appradio4? I have an S6, has anyone had any joy with this? Any solution for connecting a Moto X Pure? Why TF can't Pioneer engineer a firmware update to accommodate newer Android OS's?! I have an S6 Edge +, and an S8. Basically you're relegated to using Bluetooth only or a damn iPhone. Or fork out a ton more money for a new stereo! Thanks for nothing Pioneer! WTF? I bough the CD-MU200 cable (really just looks like it's a USB) and tried to use either the Mirror Link or AppRadio. I have a Galaxy S7. Have all the apps installed on my phone and the settings correct on the radio. Nothing, not a damn thing. I just keep getting "incompatible USB" message. Doesn't matter if I flip it HDMI or USB. What a waste of money. Pioneer's support is also terrible. I got off the phone with them today and they said I have to buy a "Wireless MiraCast Adapter" to use the Mirror Link. However, I'm not even sure that will work. Thanks for nothing Pioneer. I'm not buying an iPhone just to use my head unit. Waste of money. Find another brand if your are considering a head unit and have an Android phone.